This mussel soup is definitely one of the more concentrated of the market! 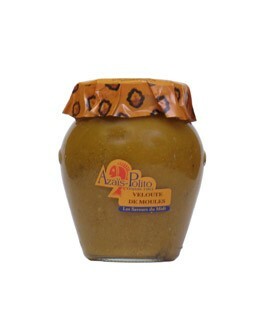 Developed in accordance with the know-how of the Azais Polito House and Sétoise tradition, it is a true concentrate of flavors... The use of high quality raw materials (without dying agent) and its traditional method of production gives this product an incomparable taste. Water, Tomatoes, Crab 20%, White wine, extra virgin olive oil, Milk, Vegetables, Carob seed flour, Garlic, Salt, Pepper, Spices and Carrageenan (seaweed extract). Azaïs-Polito is a traditional cannery specialized in fish-based dishes. It has been recognized for a long time now for the quality of its products which have become indispensable in a basket of local products of Languedoc-Roussillon. This small family business is now the last cannery in the city of Sete, the first fishing port in the Mediterranean where it was founded in 1963 by two old families from Sète. Pour the content of the jar into a pan added with one jar of water and bring to boil. Serve in a bowl along with garlic croutons topped with Rouille Sétoise and grated cheese.